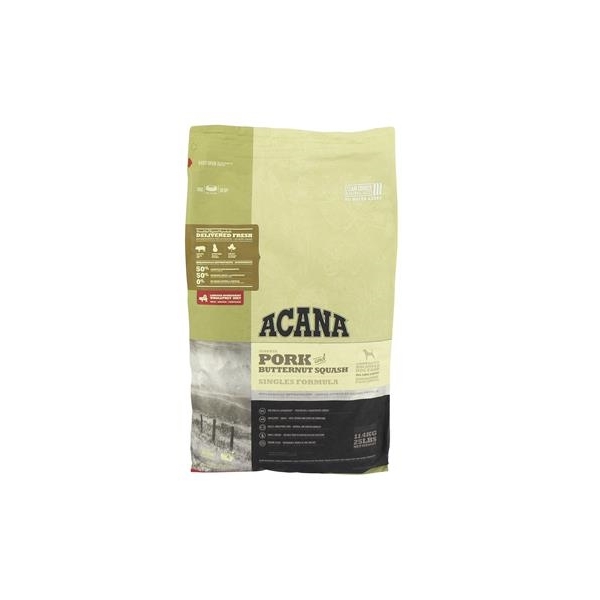 'ACANA Yorkshire Pork is a limited ingredient food featuring 50% pork, a single easily digestible animal protein, making it ideal for diet-sensitive dogs of all breeds and life stages. Raised on Alberta prairie farms, our fresh Yorkshire Pork arrives in richly nourishing WholePrey™ ratios of meat, liver, kidney and cartilage that mirror the natural diet. Fresh whole butternut squash and pumpkin provide a rich source of soluble fiber to settle sensitive stomachs and support healthy digestion. ACANA Yorkshire Pork features an unmatched variety of local ingredients that are raised or fished by people we know and trust, deemed “fit for human consumption”, and then delivered to our award-winning NorthStar® kitchens fresh each day! Fresh yorkshire pork (16%), pork meat meal (16%), whole green peas, whole red lentils, fresh pork liver (6%), pork fat (6%), fresh pork kidney (4%), fresh whole butternut squash (4%), whole garbanzo beans, whole green lentils, whole yellow peas, dried pork cartilage (2%), lentil fiber, marine algae (1.2%) (pure and sustainable source of DHA and EPA), fresh whole pumpkin, dried brown kelp, freeze-dried pork liver (0.1%), salt, fresh whole cranberries, fresh whole blueberries, chicory root, turmeric root, milk thistle, burdock root, lavender, marshmallow root, rosehips.